Gills Dry Cleaners is located on Dunlo Street in Ballinasloe Town. Our shop in Ballinasloe offers a dry cleaning and a full service laundry for all your requirements. With our full service laundry facility, we do all the work for you and offer a combination of services. With our full service laundry you can avail of a wash dry and fold service, was only, dry only, iron only or for the for the best service wash dry and iron. You can have your complete laundry requirements taken care of by us and we offer a same day service in both our dry cleaning and full service laundry if you require a quick turnaround. Our Ballinasloe premises has up to date dry cleaning facilities available and is regarded as being one of the best systems available for stain removal while been extremely gentle on your clothes and fabrics. With our modern equipment, we can literally dry clean any fabric and our staff are very experienced and professional. From suits to evening gowns, shirts, blouses and the most delicate of cashmere wools and fine silks we have the experience to make sure your garments are well looked after while in our care. Our Ballinasloe shop has the capacity to clean oversize materials like duvets, blankets, curtains and soft furnishings. Our experience and the service we provide we believe is the best available. We make sure our customers are very happy with their cleaning and the service they receive from us. We are confident that you will always get the best quality and value for money from Gills Dry Cleaners in Ballinasloe. 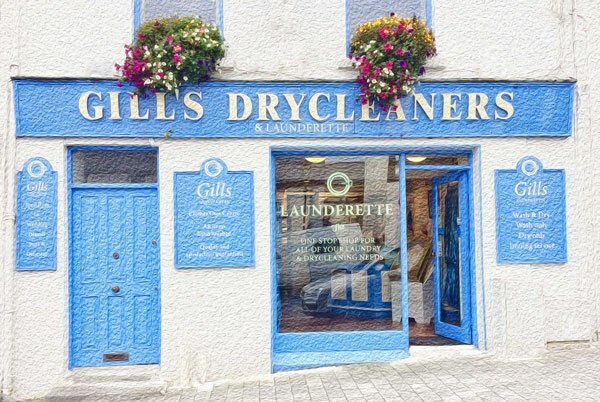 Gills Dry Cleaners Ballinasloe is located on Dunlo Street, Ballinasloe, County Galway. It is on the same street as the local Garda Siochána Station and other shops near Gills Dry Cleaners are Ladbrokes Bookmakers and The Auld Sod Pub. Parking for Gills Dry Cleaners is quite easy as there is on street car parking right outside the premises.